When you live with diabetes, there are many facets to successfully managing the disease and preventing issues in your feet and lower limbs. You need to perform daily foot inspection, use proper hygiene practices, and keep your feet dry (but not too dry). This can all be a lot to handle, so don’t hesitate to reach out to Richardson Podiatry Center for help if you need it! Now, one of the reasons for practicing smart diabetic foot care is wound prevention, and footwear plays a major role in this area. See, with a condition like diabetes, tiny cuts, scratches, and other wounds can break down and ultimately lead to conditions that result in tissue death or serious infections. The right socks and shoes can help keep feet safe and prevent a medical emergency from developing. Limit joint motion. This is a necessary function for reducing levels of pain and inflammation, and to also promote stability and foot function. 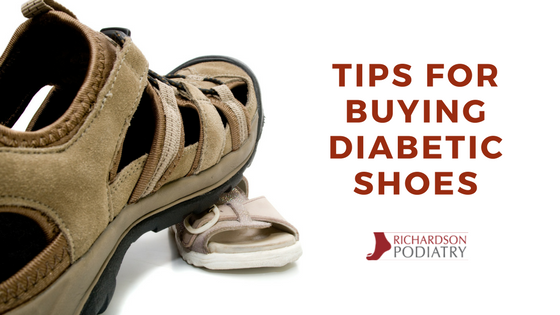 When you live with diabetes, you need to know how to prevent future problems by choosing the right size and type of shoe for you. If you wear shoes that do not fit properly, excessive friction and pressure can result in calluses, blisters, and ulcers, even when you do not have neuropathy. To ensure a proper fit, you must consider both the shape and size of the shoe and ensure that they align with the shape and size of your foot. You need to have plenty of room in the toe box, across the ball of your foot, and over the instep. You should feel a snug fit around the heel. With regard to size, keep in mind that width is also important. Wide, deep toe boxes – This means that the toes do not hit the front of the shoe, they have room to wiggle, and the ball of the foot area is not being pinched. These are essential for preventing various potential issues. Breathability – Shoes and socks need to be made of materials that allow the feet to breathe and wick moisture away, respectively. This is necessary to keep feet dry and cool, which reduces the risk of fungal and bacterial growth. Midsoles that cushion the feet – Make sure that your shoes have solid arch support and provide adequate cushioning to accommodate the forces that come with walking and standing. If you would like help choosing the right diabetic shoes that keep you safe and reduce the risk of potentially serious issues, Richardson Podiatry Center is here for you. Of course, some conditions present in diabetic feet can benefit from external shoe modifications, like adding custom orthotics or materials for stabilization or shock-absorption purposes. Healing shoes – These are used following surgery and allow your feet to recover before you go back to your normal footwear. In-depth shoes – Since you might require inserts or orthotics, in-depth shoes (which offer extra depth throughout shoe) can be quite useful for accommodating them. Inserts or orthotics – You can benefit from additional shock absorption, pressure relief, and comfort with prescribed inserts. Remember, we can evaluate your foot structure and gait pattern to identify potential risks and then recommend shoes that would work best for you. Contact our Richardson, TX office today online or call us at (972) 690-5374 for additional information on choosing the right shoes or to schedule your appointment with us.